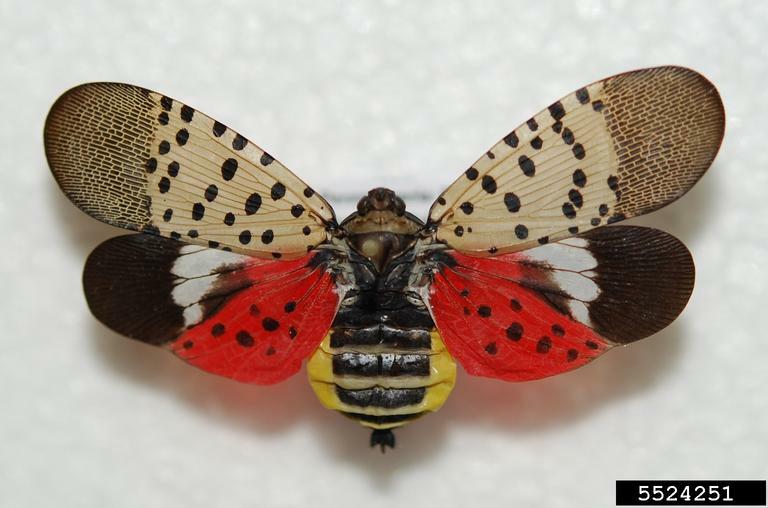 Figure 1: Adult spotted lanternfly. 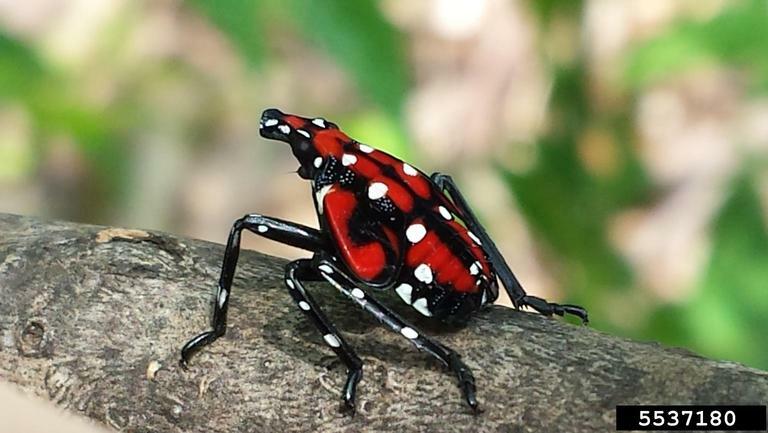 Some people may think it is a moth but it's really the Asian plant hopper known as the spotted lanternfly (SLF), Lycorma deliculata (White) and is a member of the order Hemiptera, family Fulgoridae. In the USA, spotted lanternfly is an invasive species that could be very devastating to some New Jersey crops and hardwood trees. This insect was accidentally introduced into Pennsylvania and was confirmed in the state in September 2014. At first it was only found in Berks County, however, today it has been collected from Lehigh, Northampton, Bucks, Montgomery, and Chester County. Since its discovery in Pennsylvania, a state quarantine encompassing 13 Pennsylvania counties for SLF was issued meaning that live SLF and any material or object that can spread the insect cannot be moved from the quarantine area. Populations are also present in Winchester, Virginia. In 2018, SLF populations were found in New Jersey and a state quarantine encompassing 3 counties has been established by the NJ Department of Agriculture. People and businesses travelling in and out of Mercer, Hunterdon, and Warren counties should inspect their vehicles for hitchhiking SLF as well as inspect outdoor items such as firewood, paving stones, lawn equipment, etc. for egg masses (see checklist). Quarantine compliance will reduce the spread of SLF to new areas and counties thereby protecting New Jersey resources including forests and agriculture. To help survey efforts, please report sightings (with photograph) to slanternfly@njaes.rutgers.edu. The adults are quite colorful with a black head, grayish black spotted forewings, and reddish black spotted hind wings (see Figure 1). Adults are approximately 1" in length and a 1/2" in width and are present from mid-July through the fall. During this time, SLF adults are mating and laying eggs. Egg masses are laid on smooth surfaces and appear like a patch of mud. They spend the winter in this stage and thus are VERY likely to be accidentally transported to a new location. In the spring, around mid-May, young juveniles hatch from the eggs and are black with white spots. On first glance, they may be confused with second instar brown marmorated stink bugs (see Figures 2 and 3). 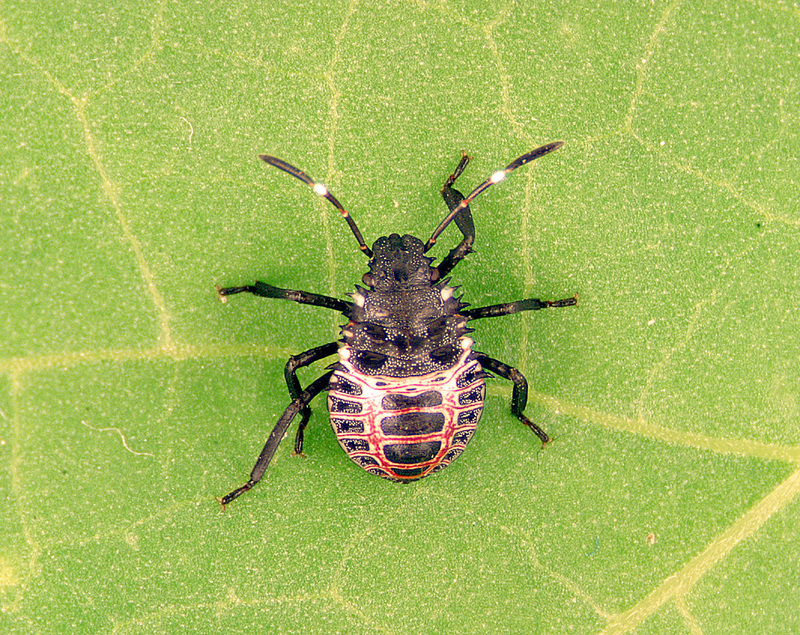 As they grow, nymphs become red and black with white spots (see Figure 4). The presence of the "polka dots" on the nymphs is distinct from most other insect species present in New Jersey. The spotted lanternfly can feed on more than 70 plant species including cultivated grapes, fruit trees, and hardwood trees. 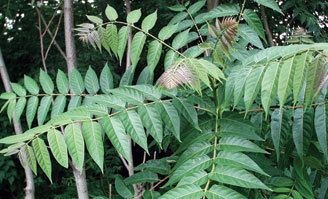 One tree of particular importance is Ailanthus altissima (P. Mill) or the Tree of Heaven (see Figure 5), which is abundant in New Jersey. Tree of Heaven typically grows in clumps in sunny areas along highways or disturbed habitats such as the edges of crop fields, open spaces, or parks. 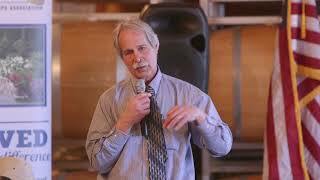 Other key tree hosts include black walnut; red maple; and agricultural crops such as grapes, hops, apples, and peaches. As with all plant hoppers, SLF has sucking mouthparts that it inserts into plant tissues to remove the fluids it needs to survive. SLF adults and nymphs are phloem feeders that feed in large congregations on woody tissue. Although there are no numbers or estimates on the economic impact of SLF—because this insect feeds in large numbers it can quickly cause damage. Feeding occurs on the trunk and limbs of plants, not on the fruit or leaf tissues. During feeding, SLF excretes significant amounts of honey dew (or sugar water). 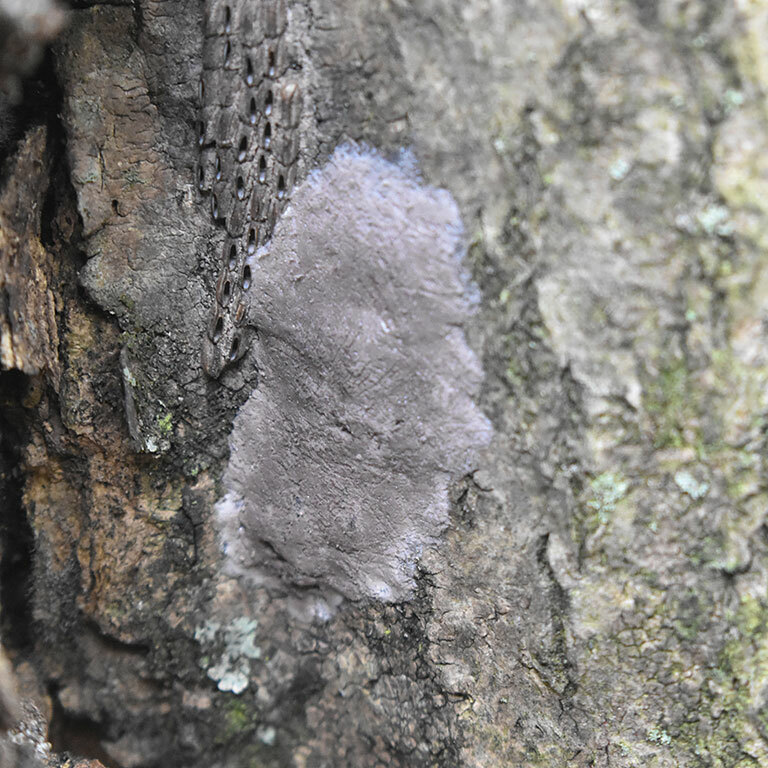 Honey dew deposits provide a food source for a sooty mold fungus that can grow on plant surfaces and fruit leading to reduced photosynthesis and plant vigor. In Pennsylvania, adults and nymphs have caused injury to cultivated grapes in commercial vineyards. Economic estimates of injury are unavailable but some Pennsylvania growers report direct yield losses due to sooty mold growth on grapes, reductions in plant health, and canopy coverage. Populations and injury are higher along vineyard edges, especially near Tree of Heaven. Interestingly, SLF tends to aggregate on a few trees or vines. In 2017 large numbers were also observed in an apple orchard just prior to harvest in Pennsylvania. In landscape plants, honey dew production and associated sooty mold development is unwanted and can reduce aesthetics and create a nuisance. When looking for SLF, survey along the perimeters of fields and on Tree of Heaven, black walnut, red maple, and wild grapevines at the edges of wood lines. Multiple egg masses can also found on trellis posts within a vineyard. Insecticides are effective but due to the high mobility of this pest, in highly infested areas, vines should be monitored closely for new bugs. Again, SLF populations in New Jersey are new and we have not had reports of populations in agricultural crops. We need your help! Quarantine compliance will reduce the spread of SLF to new areas and counties thereby protecting New Jersey resources including forests and agriculture. To help survey efforts, please report sightings (with photograph) to slanternfly@njaes.rutgers.edu. Do not apply insecticides for SLF. Please contact slanternfly@njaes.rutgers.edu, the NJ Department of Agriculture, or your local county Cooperative Extension office if you have suspected populations. 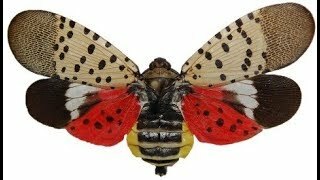 If you think you seen or collected a spotted lanternfly please report it to the New Jersey Department of Agriculture and the Department of Entomology at the Rutgers School of Environmental and Biological Sciences by emailing slanternfly@njaes.rutgers.edu. 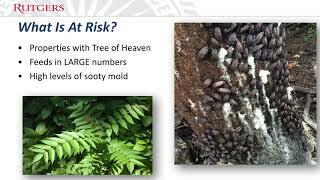 The New Jersey Nursery and Landscape Association held an information session in April 2018 about this devastating, invasive pest. 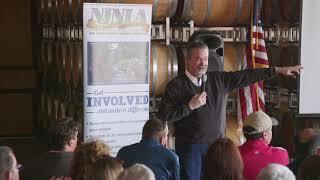 Videos of the presentations can be found below. Figure 2: Young juvenile spotted lanternfly. Figure 3: Brown marmorated stink bug second instar. 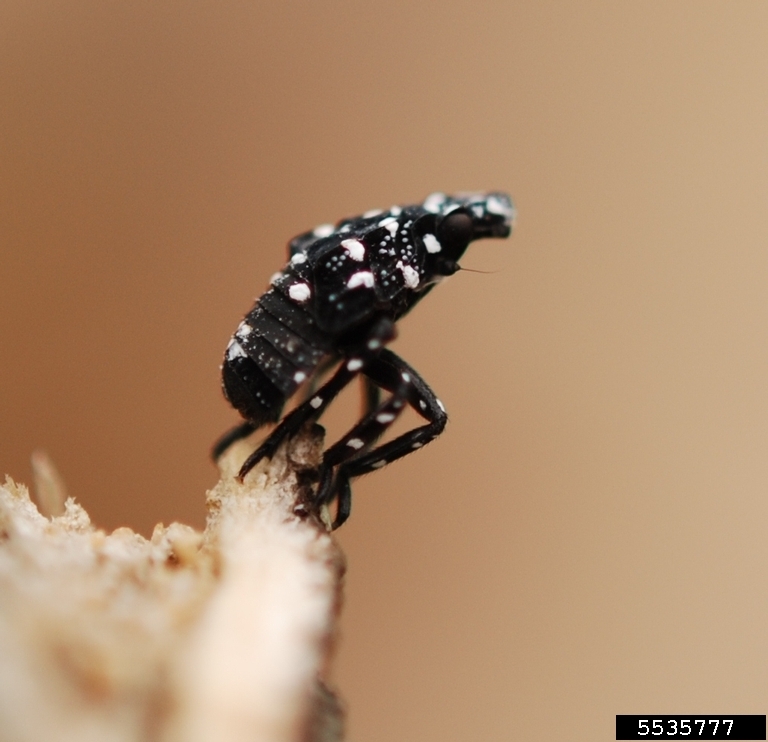 Figure 4: Older juvenile spotted lanternfly. Figure 5: Tree of Heaven. Figure 6: Spotted lanterfly egg mass. Figues 1, and 2: Lawrence Barringer, Pennsylvania Department of Agriculture, Bugwood.org. Figure 3: Deepak Matadha, Rutgers University. Figure 4: Pennsylvania Department of Agriculture, Bugwood.org. Figure 5: Paul Wray, Iowa State University. Figure 6: Anne Nielsen, Rutgers University.